Closing statements were presented to the jury Thursday in the high-profile murder trial of Chicago Police Officer Jason Van Dyke, charged in the fatal shooting of 17-year-old Laquan McDonald in 2014. Hours later, jury deliberations began. Van Dyke's fate will now be in the hands of the jury, made up of 8 women and 4 men tasked with deciding what really happened on that October night in 2014. 5:29 p.m.: Two of the jurors are also requesting smoke breaks, saying they are having trouble concentrating. The jury will be sequestered tonight and the judge is taking steps to make sure their parked cars are not towed or broken into. 5:26 p.m.: Judge Gaughan scolds Jason Van Dyke for leaving the courthouse this afternoon. Van Dyke was not here, he says, because his child was threatened at school. Judge Gaughan called it inexcusable and threatened to revoke his bond. 5:20 p.m.: Day 1 of jury deliberations comes to an end with no verdict in the Jason Van Dyke murder trial. Before excusing them for the day, the jury asked the judge for transcripts of Officer Joe Walsh’s testimony- Van Dyke’s partner. 12:33 p.m.: After nine days of testimony from 44 defense and prosecution witnesses, the fate of Jason Van Dyke now lies in the hands of eight women and four men. They will deliberate two counts of first-degree murder, a lesser charge of second-degree murder, 16 counts of aggravated battery and official misconduct. 12:28 p.m.: Jury deliberations begin in the Jason Van Dyke murder trial. Their verdict will come almost four years to the day of that fateful night. 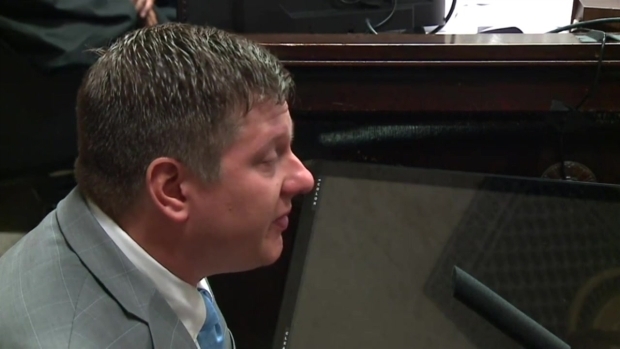 12:03 p.m.: Judge Vincent Gaughan tells the jury that Jason Van Dyke is presumed innocent of all the allegations against him, unless they are convinced, beyond a reasonable doubt, that the allegations were proven. 11:55 a.m.: Prosecutors end by telling the jury that the 16 bullets that pierced Laquan McDonald’s flesh were "not justified, not necessary. It was first-degree murder." The jury is now receiving their deliberation instructions. 11:47 a.m.: Over and over again, the special prosecutor uses Van Dyke’s own words against him, saying Van Dyke was intent on shooting Laquan when he told his partner, before they even arrived on he scene. "Why didn’t they shoot him if he’s attacking them...we’re going to have to shoot him." 11:30 a.m.: Prosecutors get final word with rebuttal closings. "What you’re not going to have to consider is motive, or malice or premeditation. It’s not relevant. [It’s] nothing the state has to prove beyond a reasonable doubt." 11:15 a.m.: Dan Herbert closes by reiterating that officers are allowed to use deadly force. That police are here to protect and serve. Then tells the jury, the right decision is not always the easiest decision. "No one can fault you. Follow your heart. Follow your soul. Follow your mind." 10:30 a.m.: Defense attorneys are now trying to hammer home the point that the evidence presented provides reasonable doubt. They are pulling up transcripts from trial testimony in which witnesses testified that they considered Laquan McDonald’s actions that night threatening. 10:21 a.m.: Dan Herbert describes the the shooting as a tragedy, not a murder. And that it could have been avoided if only Laquan McDonald would have dropped the knife. He says the charge of first-degree murder is unprecedented. 10:17 a.m.: Defense begins closing arguments by thanking the jury, but says they still have work to do. "Your job is just beginning. Now you have to make the determination that decides the fate of Jason Van Dyke." 10:13 a.m.: After just 27 minutes, the prosecution ends is closing arguments with a final thought for the jury. "When [the shooting is] not justified, it’s first-degree murder. It’s aggravated battery. It’s official misconduct. No one is above the law." 10 a.m.: Prosecutors are driving home the fact that Laquan McDonald was riddled with bullets and bled to death. They show the jury his autopsy photos again, "[McDonald] was riddled with bullets, broken and and bleeding when the defendant finished shooting." 9:53 a.m.: During closing arguments, prosecutors reveal that jurors can deliberate a lesser charge of second-degree murder. Not just first-degree murder. 9:48 a.m.: "It’s not the Wild West out there. 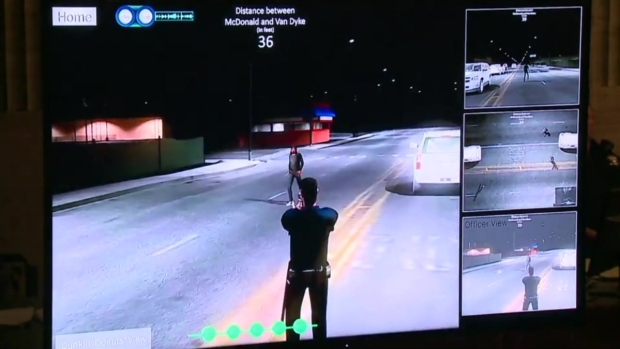 Officers can’t just shoot someone and justify it later." 9:45 a.m.: Closing arguments begin in Jason Van Dyke trial. "Laquan McDonald was never going to walk home that night. The defendant said on the way to the scene, "We’re going to have to shoot the guy."